'Myhome' was built for Francis S. Smithers, founder and partner of the investment banking firm of F.S. Smithers & Co., on Red Spring Lane in Glen Cove. Ellen Biddle Shipman was responsible for the landscaping, but other than that not much is known on the house. Smithers died in 1919. Pics in your last several posts have been extraordinary. Thank you for sharing the history you love so much. 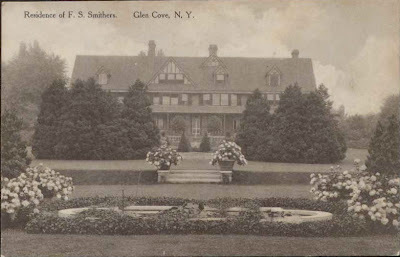 Didn't Francis Smithers also own an estate named Dunrobin on Overlook Rd overlooking Oyster Bay which demolished during The Great Depression? There was a carriage house and servant's house with an attached greenhouse. I believe a cottage still remains, and is for sale. Im not sure of its original purpose.